The Council is headquartered in Downpatrick. Other towns in the Council area are Ardglass, Ballynahinch, Castlewellan, Clough, Crossgar, Dundrum, Killough, Killyleagh, Newcastle, Saintfield, Seaforde and Strangford. The Down District Council area consists of 4 electoral areas: Ballynahinch, Downpatrick, Newcastle and Rowallane. At the last election in 2011, 23 Councillors were elected from the following political parties: 9 SDLP, 5 Sinn Féin, 3 DUP, 3 UUP, 1 Alliance Party, 1 Green Party, 1 Independent. The Council Chairman for the 2011/2012 council term is Councillor Dermot Curran (SDLP) and the Vice Chair is Councillor Liam Johnston (Sinn Féin). In elections for the Westminster Parliament it is split between the Strangford constituency and the South Down constituency. The Council has periodically had to provide funding to ensure that the Saint Patrick Visitor Centre in Downpatrick remains in operation. It has also funded a major promenade infrastructure regeneration in Newcastle. The new promenade has won a number of National awards including a Civic Trust Award for Excellence in the Public Realm. Under the Review of Public Administration (RPA) the Council was due to merge with Newry and Mourne District Council in 2011 to form a single council for the enlarged area totalling 1539 km² and a population of 150,886. The first election to the new council was due to take place in May 2009, but on 25 April 2008, Shaun Woodward, Secretary of State for Northern Ireland announced that the scheduled 2009 district council elections were to be postponed until the introduction of the eleven new councils in 2011. The planned change was abandoned in 2010 and the most recent election took place in May 2011 under the existing boundaries. 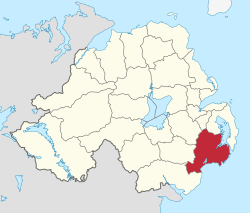 The area covered by Down District Council has a population of 69,731 residents according to the 2011 Northern Ireland census. Down District Council Facts for Kids. Kiddle Encyclopedia.